The congressional appropriation process is now underway and there’s lots of news about the Higher Education Act (HEA). Read below to learn more about how to support the federal investment in CTE by contacting your Representative about signing a “Dear Colleague” letter and how Congress and President Trump are focusing in on HEA . Representatives Langevin (D-RI) and Thompson (R-PA), co-chairs of the Congressional CTE Caucus, will be sending a “Dear Colleague” letter to the Chairwoman, Rosa DeLauro (D-CT) and Ranking Member, Tom Cole (R-OK) of the Appropriations Subcommittee on Labor, Health and Human Services, Education and Related Agencies respectfully encouraging that they consider strong funding for Perkins. Please contact your Representative to encourage them to sign on to the letter by visiting ACTE’s Take Action page and scroll to “Ask Your Representative to Sign Perkins Funding Letter” and click “Take Action.” You can also find your representative, call the Capitol Switchboard at 202-224-3121 to be connected to their office, and then ask about the Representative’s interest in signing on to a “Dear Colleague” letter to support strong funding for Perkins. Interested Representatives can contact the offices of Representatives Langevin (D-RI) or Thompson (R-PA) to sign on. The deadline to sign on is 5pm Eastern Time on Friday, March 22. Give Prospective Students More Meaningful and Useful Information about Schools and Programs. Advance CTE will continue to monitor efforts in Congress to reauthorize HEA and provide updates. On March 14, Senators Kaine (D-VA) and Portman (R-OH) reintroduced the Jumpstart Our Businesses by Supporting Students (JOBS) Act. This legislation would expand Pell Grant eligibility to high-quality short-term postsecondary programs. Eligible short-term programs would have to be at least 150 clock hours over at least eight weeks, meet local or regional labor market needs, articulate to institutional credit and provide students with a recognized postsecondary license, certification or credential. Also on March 14, Senators Cassidy (R-LA), Warren (D-MA), Scott (R-SC) and Whitehouse (D-RI) reintroduced the College Transparency Act. This legislation would create a student-level data network within the National Center for Education Statistics and promote transparency and accuracy in postsecondary student data. On March 12, Senators Kaine and Collins (R-ME) reintroduced the Preparing and Retaining Education Professionals (PREP) Act. This legislation aims to help address teacher and principal shortages, particularly in rural areas. Advance CTE is proud to support all three of these bills, and will continue to advocate for legislation that reflects our HEA recommendations. The Senate Health, Education, Labor & Pensions (HELP) Committee held its first HEA hearing this year on “Reauthorizing the Higher Education Act: Simplifying the FAFSA and Reducing the Burden of Verification.” Chairman Alexander (R-TN) and Ranking Member Murray (D-WA) agreed that the Free Application for Federal Student Aid (FAFSA) must be simplified to be more accessible. The House Committee on Education and Labor also held its first of five announced HEA hearings on “The Cost of College: Student Centered Reforms to Bring Higher Education Within Reach.” In his opening remarks, Chairman Scott (D-VA) share that his goal is to pass comprehensive higher education reform, with a focus on access and affordability. Topics that came up throughout the hearing included improving the purchasing power of Pell Grants, simplifying FAFSA, responding to state disinvestment in higher education, making college more affordable and simplifying student loan repayment. During the last week, the President released his budget proposal for Fiscal Year 2020 (FY20), the American Workforce Policy Advisory Board held a meeting and there’s news about the implementation of the Every Student Succeeds Act (ESSA). Read below to learn more. On March 11, President Trump released the budget proposal for Fiscal Year 2020 (FY20), which begins October 1. The President’s budget proposal is typically released the first Monday in February, but this year’s partial government shutdown delayed the process. Importantly, the release of the President’s budget proposal formally begins the appropriations process, during which Congress will decide the extent to which they align their funding decisions with the priorities laid out in the President’s budget proposal. CTE State Grants: proposed level funding for the Perkins Basic State Grants at the amount provided by Congress in FY19. The President’s budget also includes the recommendation that Congress authorize changes to increase the fees collected for H-1B visas and redirect 15 percent of that revenue to provide an increase in funding for CTE State Grants. However, we are still examining this proposal and at this point, it is unclear if this would be a practical way to ensure more resources for CTE State Grants and how much funding could be realized. National Programs: proposed increase of $12.58 million above the amount provided by Congress in FY19 to support the new Innovation and Modernization grants authorized under Perkins V.
Student Support and Academic Enrichment Grants, authorized under Title IV-A of the Every Student Succeeds Act (ESSA), which can support CTE as part of a well-rounded education: proposed for elimination. Supporting Effective Instruction State Grants, authorized under Title II of ESSA, which can support CTE professional development: proposed for elimination. Pell Grants: proposed to keep the maximum Pell grant frozen at its current level, rescind $2 billion from the the Pell reserve (the unobligated funds for the program that have been previously appropriated), and expand the access to the Pell grant to short-term programs. Advance CTE is supportive of expanding Pell grants to shorter-term programs as outlined in the JOBS Act, which has bipartisan support. State formula grants provided through Title I of the Workforce Innovation and Opportunity Act (WIOA): proposed level funding at the amount provided by Congress in FY19. Adult Education and Family Literacy State Grants: proposed decrease of $156.2 million below the level provided by Congress in FY19. Apprenticeship grants: proposed level funding at the amount provided by Congress in FY19, noting that these funds should be directed to Industry-Recognized Apprenticeships. Advance CTE will continue to monitor the appropriations process and will let you know when it is time to contact your members of Congress. “First is to develop a robust campaign to promote multiple pathways to good-paying jobs, dispelling the myth that there is only one path to a successful career. Second, improving the availability of high-quality, transparent, and timely data to better inform students and educators, as well as match American workers to American jobs. Third, modernizing candidate recruitment and training practices to expand the pool of job applicants employers are looking to hire. Additional remarks from the meeting are now available. Advance CTE will continue to provide updates on the advisory board. For the first time, the Every Student Succeeds Act (ESSA) requires states to publish school-by-school spending data to illuminate where and how taxpayer dollars are being spent on education. According to an analysis from Georgetown University, 14 states have now made this information public. Many states are still working through the process of collecting and publishing their spending data. According to EdWeek, five states – New Mexico, Indiana, Michigan, South Carolina, and Wyoming – are considering revisions to their ESSA state plans. Most of the proposed changes involve restructuring the school rating system without significantly altering the accountability indicators. Perkins V: How can states use this opportunity to communicate about CTE? As states begin the process of developing their state plans for the Strengthening Career and Technical Education for the 21st Century Act (Perkins V), it is critical for communications to be front and center in a state’s overall efforts to create – and eventually implement – its Perkins V state plan. Given the incredible interest in and spotlight on Career Technical Education (CTE) from so many policymakers, industry leaders and families, having a proactive communications strategy that has a clear and compelling message is more important now than ever. Communicating early and often is imperative to helping facilitate the many changes that will be coming as a result of Perkins V. Find tools and resources below to help you communicate with a variety of audiences. TOOL: Communicating About Perkins V (Word and PDF): This tool aims to help state leaders think through their overall communications strategy throughout the process of developing and implementing a Perkins V state plan. GUIDE: Key Tips for Engaging Policymakers: Straightforward advice on preparing to brief new leaders, with tailored guidance for and questions to expect from new governors, legislators, state board members, and K-12 and postsecondary leaders. PowerPoint: “CTE in Your State” PowerPoint Template and related tips: A basic template and related guidance to help state leaders build their own materials. PowerPoint, Fact Sheets and Brochure: Idaho has delivered a number of presentations on CTE, including to their state legislature, backed up by fact sheets and Alabama created a brochure for new leadership. Communications and advocacy strategy: Saginaw Intermediate School District developed a communications and advocacy strategy to promote their local millage to increase CTE funding. Tools for Engaging Parents and Learners: Find Advance CTE’s research, tools, and resources on our webpage for engaging parents and learners. 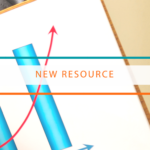 The next issue of this series will include resources on the comprehensive local needs assessment and in the meantime, please be sure to check out the Learning that Works Resource Center. Posted in News, Uncategorized | Comments Off on Perkins V: How can states use this opportunity to communicate about CTE? 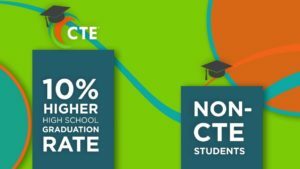 Career Technica l Education (CTE) in Hawai’i serves over 33,000 learners each year. In fact, because we operate as a single statewide school district, we’re one of the largest districts in the United States. We offer programs in a diverse array of industries from architecture to healthcare, preparing learners for bright futures in in-demand, living-wage careers. The outcomes of CTE demonstrate how effective it is in setting learners up for success. Our secondary learners graduate high school at a rate of 98 percent, about 14 percentage points higher than the national average. Our postsecondary learners also have exciting opportunities to pursue programs in a variety of fields that make a difference in our community. For example, Hawai’i, like most states, has struggled with a severe shortage of CTE teachers. One of the contributing factors was that there was not a single program in the state where individuals could earn a CTE teaching certificate. That’s when Leeward Community College stepped in and developed an alternative CTE licensure program. This one-of-a-kind program is accredited and has produced high school CTE teachers that serve as instructors in all of Hawaii’s CTE pathways across all of Hawaii’s islands. To make opportunities like this possible, Hawai’i took advantage of federal and state funds for CTE. Doubling the federal investment in CTE would mean that Hawai’i could make more opportunities like this one available to learners. We would be able to develop more industry partnerships, support more programs that allow learners to gain real-world skills, and scale up programs like the one at Leeward Community College. For Hawai’i, doubling the investment in CTE would create more career options for our learners and a brighter future for our community. This article was written by Bernadette Howard, State CTE Director at the University of Hawaii and President of Advance CTE’s Board of Directors. When students enter the job market, they will need to know the global dimensions of their career pathway and how to work with people from different backgrounds – including here in our increasingly diverse country. 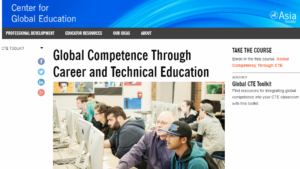 Recognizing the incredible opportunities and necessities of linking Career Technical Education (CTE) and global competencies is why Advance CTE partnered with Asia Society, Association for Career and Technical Education (ACTE) and Longview Foundation to release Preparing a Globally Competent Workforce Through High-Quality Career and Technical Education back in 2015. Since the release of this report, this partnership has continued, leading to the development of the Global CTE Toolkit, which houses many curricular and instructional tools for embedding global competencies into CTE teaching and learning. This work is now extending to focus squarely on STEM, with Advance CTE, the Global Education at Asia Society and ACTE partnering to create new online professional development modules that support CTE educators in integrating STEM content into their classrooms while teaching global skills via active, project-based learning. These 10 new modules – entitled Career Readiness in a Global Economy: STEM and CTE – will help educators understand how to make global connections to local issues; create high-quality global STEM projects; assess global workforce readiness skills; connect with classrooms abroad to complete collaborative projects; and teach students to be project managers so they are more successful in completing their projects. These new modules, together with sample curriculum and other tools and resources are now being piloted and we are looking for state and local leaders and practitioners to join in and give your feedback. For each 15-minute module you give feedback on, you will be entered into a drawing for one of two $100 Amazon gift cards. All materials are free of charge due to generous support from the Project Management Institute Educational Foundation (PMIEF). If you are interested in piloting these new materials, please visit CTE Learn, create a free log-in, and click on the Career Readiness in a Global Economy: STEM and CTE, button to get started. Also, feel free to share the link and information with others in your states and communities. Contact Heather Singmaster at hsingmaster@asiasociety.org with any questions. All surveys must be completed by February 15, 2019 to be entered into the drawing. Join Advance CTE on Thursday, September 20 from 2 – 3 p.m. ET for Advance CTE’s webinar, The State’s Role in Communicating About Career Technical Education (CTE). Advance CTE will feature Idaho Career and Technical Education and how they have transformed the way in which they communicate about CTE with all stakeholders. Caty Solace, Outreach and Communications Manager at the Idaho Workforce Development Council, will discuss how Idaho CTE created a statewide brand, introduced storytelling as a major component of their communications plan and the tactical strategies they used to better communicate about the value and promise of CTE across all audiences. Today, the President signed the Strengthening Career and Technical Education for the 21st Century Act (Perkins V), which reauthorizes the Carl D. Perkins Career and Technical Education Act (Perkins). As we reported, the House and Senate voted to pass this bill last week. President Trump will travel to Tampa Bay Technical High School this evening to provide remarks about the bill and host a roundtable on workforce development. Watch it live at 6:10 p.m. Eastern Time. Advance CTE and ACTE released a joint press statement after the President signed H.R. 2353 into law. Check out additional resources on our webpage. To make sure you get the latest news and resources about federal policy that impacts Career Technical Education (CTE), sign up for our Legislative Updates! 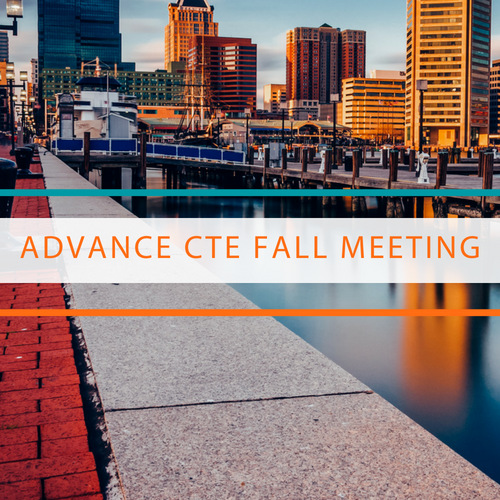 Join us October 22-24 in Baltimore, Maryland for the 2018 Advance CTE Fall Meeting! Registration is now open for this three-day professional development conference that explores the latest issues and challenges influencing Career Technical Education (CTE) today. We are offering an Early Bird Rate that saves you $100, available until August 10. Our annual Fall Meeting draws state CTE leaders from nearly every state. We look forward to seeing you in Baltimore. View hotel information, registration rates and sponsorship opportunities here. We are excited to announce a new CTE video as part of the CTE: Learning that works for America® campaign for you to watch and share with your community. We know that how we discuss CTE in the media, with policymakers, employers and families matters. We are thrilled to share a new video that showcases what today’s CTE looks like and how it prepares learners for their future careers while closing the skills gap for employers across the country. We know that learners who participate in CTE graduate at a higher rate, are more satisfied with their education, and just as likely as non-CTE students to go on to postsecondary education. Now, it’s time that everyone understands the incredible value of CTE. This video is designed to help you make the case for CTE in your community and demonstrate the many benefits of today’s CTE! Share it at your statewide meetings, with partners, and encourage your networks to use it too. We’ve developed a promotional toolkit to get the word out on this video, which you can find here. If you’re curious about the data points in the video, check out our one-pager on the data here. To get you started here are two tweets you can share right now, but be sure you are following us on twitter @CTEWorks. As Congress continues its work on the Fiscal Year 2018 (FY18) appropriations process, efforts to encourage support for programs for FY19 are underway. Read below to find out how you can support a strong federal investment in Perkins and to learn about new updates from the U.S. Department of Education. The two co-chairs of the House CTE Caucus (Representatives Langevin (D-RI) and Thompson (R-PA)) will be sending a letter to the Chairman, Tom Cole (R-OK) and Ranking Member, Rosa DeLauro (D-CT), of the Appropriations Subcommittee on Labor, Health and Human Services, Education and Related Agencies encouraging that they consider strong support for Perkins. Right now, Reps. Langevin (D-RI) and Thompson are asking for their colleagues in the House to join them in signing this letter (their request is formally called a “Dear Colleague” letter). Please consider contacting your Representative by March 14 to encourage him/her to sign on to the letter by using the Association for Career and Technical Education (ACTE) Action Center or by calling the Capitol Switchboard at 202-224-3121 and asking your Representative to sign onto the Fiscal Year 2019 (FY19) Perkins appropriations letter. Looking for resources on Perkins funding or how it’s used? Check out the new Perkins page on Advance CTE’s website. The Advancing Equity in CTE Community of Practice is now live on the U.S. Department of Education’s Literacy Information and Communication Systems (LINCS) site. This moderated community offers CTE educators a forum to engage in thoughtful discussions and share tools and resources to increase equity in CTE programming. You can pose questions and help answer those of colleagues. In addition to facilitated discussions, other equity-focused professional learning opportunities will include webinars, interactive resource reviews, blog posts, and important event announcements.